Reports from the lab: Biology: Why are cells so small? Biology: Why are cells so small? I've been getting some push back from the kids on all the tiny stuff we've been studying: microscopes, cells, chemistry, etc. So before we move on to bigger and better things, I thought we should at least address one last itsy bitsy, but not unimportant question: Why are cells so darn small? Even elephants, whales, and oak trees, big as they are, are made of of tiny cells, the same size as the unicellular organisms we found in drops of pond water. To answer this question we looked at potatoes. The potatoes represented cells, and we submerged these potato cells in iodine, which stood for oxygen, food, waste or whatever stuff needed to be moved in or out of the cell. We cut up potatoes into 2 different-sized cubes: teeny tiny (c. 0.5 cm3) and large (c. 5 cm3). We placed these in a jar of iodine and waited. After about 20 minutes, we removed the potatoes, now black after reacting with the iodine, and sliced them in half. 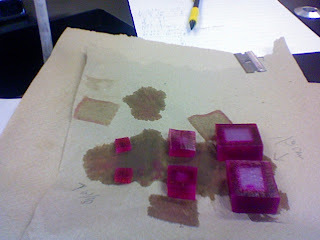 The idea was to see how far the iodine penetrated the potato (Picture shows similar experiment done with agar cubes absorbing phenolphthalein). In both teeny tiny and large potatoes the iodine moved less than a millimeter in. However, the big difference was when we considered what percentage of the potato had been exposed to the iodine. We discussed how the surface area of cell is a limit on how much stuff can be moved in and out of a cell, while the volume of the cell determines the demand on imports (food, O2, etc) and exports (waste products). In large cells, there is simply too much volume for the surface area to handle, and the cell cannot move stuff in and out of the cell fast enough to meet the cell's needs.